Today’s military deployments require satellite communication equipment that is smaller, lighter, draws less power, is easier to setup and yet delivers higher bandwidth than ever before. 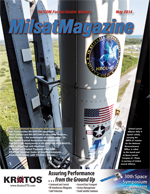 Given the growing importance of assured military satellite communications (MILSATCOM) to successfully execute global missions, the Department of Defense (DoD) is facing significant near-term decisions concerning the future of satellite communications. It is extremely important to make the right decisions, objectively and intuitively, as MILSATCOM systems take decades to acquire and field. Communications that are not assured potentially jeopardize mission execution with catastrophic implications for our national security. Military missions simply cannot succeed without reliable communications. This means satellite technology is essential for operations. MILSATCOM allows combat outposts to link directly with the command center, base compound, remote missions facilities, strategic operations, enable the use of Communications-on-the-Move (COTM) and facilitate the emergencies remediations. For many consumers of high technology, your mobile device does more than just connect to the web or make calls; increased choice has made this a purchase that says a lot about your identity, too. In the recent Message from the Chair, penned by HPA Chair Janet Nickloy in HPA’s end-of-year newsletter, she reflects on the trajectory the Alliance has taken over the past year, and outlines where the organization intends to go in 2014. From NASA and the U.S. Department of Defense to industry giants and creative entrepreneurs, it’s no coincidence so many organizations are embracing the weight, cost, and quick deployment advantages of small satellites (smallsats) and nano-satellites (nanos) for missions ranging from imagery to national security and essential communications for Warfighters. Maritime domain awareness refers to the understanding of anything associated with a nation’s maritime domain that could impact the security, safety, economy, or environment. With water covering about 70 percent of the planet, maritime domain awareness is one of the most important activities undertaken by national and international agencies. Hosted payload has become a catchphrase within the satellite industry in recent years, and with the first U.S. Hosted Payload Solutions (HoPS) program contracts expected this June, it will draw more attention and expectations in the overall manufacturing market. A growing base of pilot programs and alternative hosting methods from manufacturers support an expansion of the use of hosted payloads, yet challenges remain before the model attains sufficient maturity to be implemented across the spectrum of potential applications. Craig Weston is President and Chief Executive Officer of U.S. Space, LLC, a U.S.-owned provider of dedicated, commercial space solutions to serve the interest of the nation and its coalition partners and commercial enterprises worldwide.